The beautiful city of Charlotte in North Carolina has a lot to offer. As the biggest city in the entire state, Charlotte is regarded as the cultural and commercial hub of NC, featuring many tourist attractions, exciting nightlife, a beautiful cityscape, and all sorts of monuments to visit and outdoor activities to enjoy. If you’re looking for a zoo to see some wild animals in Charlotte, however, you’re out of luck. The city doesn’t have its own zoo just yet. Fortunately, many other great zoos and animal attractions can be found right nearby. Here are some details on the best zoos near Charlotte, NC. More than 1,600 animals can be seen here from over 250 different species in total. The zoo is open almost non-stop and welcomes hundreds of thousands of visitors each year. It features the biggest collections of chimpanzees in the US, as well as many other iconic species from polar bears to rhinos, African elephants, gorillas, lions, and more. A ninety minute drive in a different direction to the NC Zoo is Riverbanks Zoo, another popular zoo in the Charlotte area. This location actually doubles up as an aquarium and botanical garden too, so there's a lot to see for nature and animal lovers of all kinds. Set in a picturesque spot on the Saluda River in Columbia, SC, the Riverbanks Zoo covers an area of 170 acres and has been operating since the mid-1970s. This zoo welcomes over a million visitors each and every year, featuring more than 2,000 animals in total. Whether you're interested in huge mammals like giraffes and elephants, thrilling reptiles like Komodo dragons, tropical fish, or something else altogether, you'll find it at Riverbanks Zoo. The 70 acre botanical garden is another beautiful part of this attraction, with the Waterfall Junction area being a huge hit with young children in particular. For a live animal attraction right near Charlotte, NC, check out the Carolina Raptor Center in Huntersville, just a 20 minute drive out of Downtown Charlotte. As the name suggests, this location is fully dedicated to raptors, also known as birds of prey, with species like eagles, owls, falcons, and hawks. Over three dozen species of birds can be seen at this highly educational location, which does a lot of great conservation work and also runs camps, school programs, and even adult education sessions to help people of all ages learn more about these fascinating creatures. Various exciting events can be enjoyed at the Carolina Raptor Center, including live encounters and shows with birds of prey and different exhibits to be discovered along the center's trails. Enjoy the thrilling sights of live animals from the comfort of your own car at the Lazy 5 Ranch. 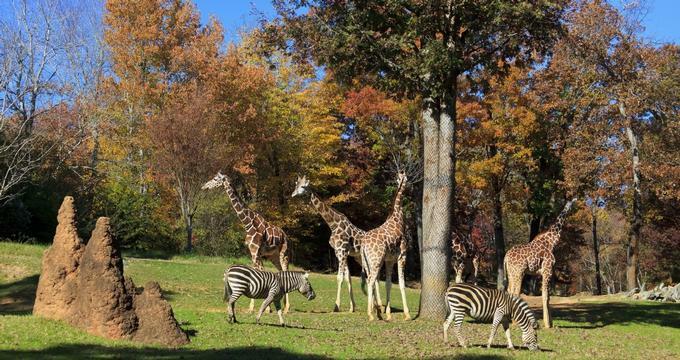 This Charlotte zoo can be found just a very short drive out of the city and features all kinds of exotic species like giraffes, rhinos, camels, kangaroos, porcupines, tortoises, and more. This is the only drive-through zoo experience in the Charlotte area and visitors have the choice of using their own vehicles or simply climbing aboard one of the horse-drawn wagons operated by the park staff. The safari route runs for 3.5 miles through the Lazy 5 Ranch, offering some great photo opportunities and views you'll never forget. Some people object to zoos due to the commercial side of their operations, but Tiger World is a fully non-profit organization that is totally dedicated to protection and conservation of tigers and other endangered species. It's a highly educational place to visit, with tours running through most of the week. Located less than an hour from Charlotte, this center is staffed with animal lovers and people who really want to make a difference to these big cats and other species.